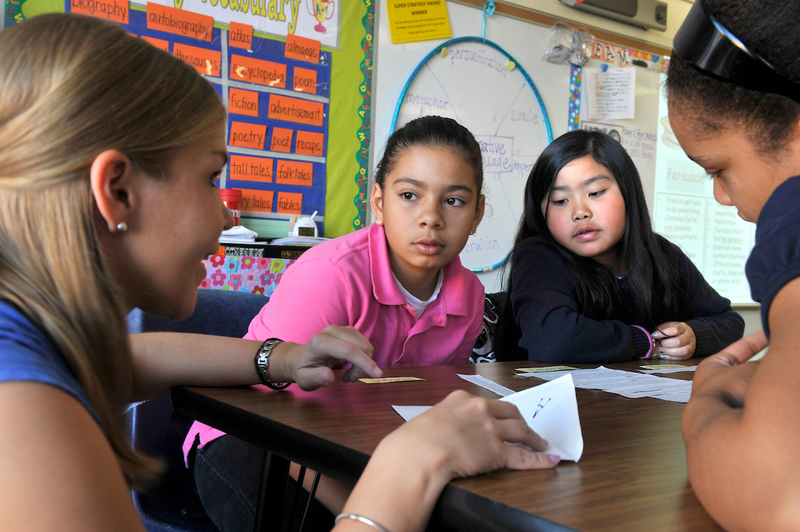 MATH & READING CONNECTIONS—Students in Charlotte-Mecklenburg Schools learn math from teachers who receive extensive PD in providing rigorous instruction to English language learners. For Charlotte “Nadja” Trez, the math struggle of English language learners is personal. Eighteen years ago, the Charlotte-Mecklenburg Schools administrator was an ELL student herself. Trez, now the North Carolina district’s executive director of ELL Services, had just moved to the United States from South Korea, and she found herself in a classroom tasked with learning English and keeping up with her peers in core academic classes. Here, Trez, Bresser and other educators present five broad best practices for blending reading and language into math instruction. Trez uses a professional development program called Personal Academic Command for English that integrates the language of math with math content, “because we are all math learners,” she says. The program introduces techniques that teachers can integrate into their math curriculum. One strategy, called “Novel Ideas,” activates prior knowledge of math vocabulary and is completed in a cooperative learning environment. An example of a math vocabulary word is “steep,” which has multiple meanings. Teams of students will compile all the meanings for that word and share their lists with the rest of the class. Each team will have a meaning or idea of the word that the other teams don’t have—that meaning will be considered a novel idea. This exercise gives teachers guidance on what students already know about the term, and provides students with a visual list that shows the word’s various associations. ELL students must learn math problem-solving skills along with computation, says Michael Orosco, associate professor of special education at the University of Kansas. Orosco, while a K12 teacher in Colorado, used the University of Chicago’s Everyday Mathematics curriculum to shift to conceptual-based math. He noticed that when he put up a problem with numbers in it, the ELL students understood. Math and language teachers in Charlotte-Mecklenburg Schools now collaborate more closely to develop lessons. That’s when Orosco brought reading comprehension strategies into his ELL math classroom. He also conducted a study of 78 students and found that scores and achievement improved for the students who were taught math with reading comprehension. For example, the word “discount” must be understood before a student can figure out how much a $1,200 computer will cost if it’s on sale for 20 percent off. Teachers will have to sound out the word and then teach the concept of discount. Use everyday terms, or synonyms, in conjunction with academic terms, and whenever possible, use cognates like triangle and “triángulo,” for example, says Bresser, of University of California San Diego. This strategy can only be used with languages that share roots. Teachers should also make visual vocabulary charts and draw pictures, such as squares. Teachers can draw a picture that shows evens and odds, and give examples. Visuals make everything transparent, Bresser says. Teachers can also provide support through the use of sentence frames. For example, if you are teaching about a square, frame the question like this: “A (square) has (four) sides.” Leave square and four blank. That way, students have a tool in which to frame the sentence and learn the important math concept. Finally, Bresser says, consider using the native language to translate concepts. Teachers can partner students with math buddies. For example, place a fully bilingual student with an ELL, so the former can help translate. This will benefit both students, Bresser says. Students also need opportunities to talk during a whole class discussion. For example, ask if eight is an odd or even number. Then have students turn to each other and talk about how they decided on an answer. Another effective method is choral response, also called “echo talk.” For example, the teacher says: “I’m going to say something, and you are going to say it back. The square has four vertices.” That way, the teacher is modeling and the students are repeating the concept. It supports learning the new language, Bresser says. Educators also need to remember that learning a new language is difficult, regardless of age, Bresser adds. Currently, 10 percent of the U.S. student population is ELL. In some states, such as California, that number can be as high as 25 percent. Shawna De La Rosa is a freelance writer in Washington. Jessica Schmettan has been named as Port Jefferson School District's superintendent of schools. She currently serves as the assistant superintendent for curriculum and instruction in the district. She will replace Superintendent Paul Casciano. More frequent and intense natural disasters require school leadership to address trauma and prepare for extended disruptions.